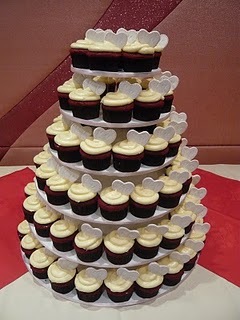 Wedding Cupcakes are one of the most popular trends for chic weddings nowadays. They are often given out as wedding favors or used as a replacement of the traditional wedding cakes. The bridal couple will be able personalize their cupcakes which can come in more than one flavors. And of course, my husband and I offered our guests wedding cupcakes as wedding favors at our wedding back in Nov 2010 as well. We ordered two flavors, the red velvet and snowball, from Sift Desserts HK and they have definitely done a fantastic job. 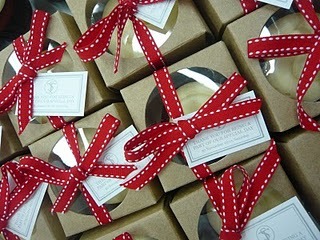 Each cupcake was individually wrapped in their party favor boxes and ribbon tied with a matching red and white ribbon, as well as customized tags. 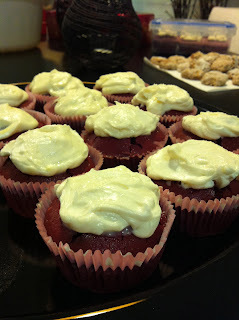 I had fallen in love with the red velvet cupcakes ever since then and attempted to bake some on my own. Vanilla Cream Cheese Frosting: Beat cream cheese, softened, butter, sour cream and Pure Vanilla Extract in large bowl until light and fluffy. Gradually beat in confectioners’ sugar until smooth.